Vladimir Putin and his suite understand an important role of political advertisement more than very well. They use systematically every opportunity to be visible. Sometimes this effort can affect ridiculously or awkwardly, particularly abroad, but most of his PR moves bring intended points to Putin. His promotion has various faces. The spectrum inside which he moves is very broad: from a caring politician or an experienced commander, through a curious scientist-amateur to a skilled woodsman or a biker-devotee to freedom. Vladimir Vladimirovitch tries to do his best but the results are usually very different. All depends on a performed role. It is evident that Putin has a minimal problem when he shall play a role of a soldier. It would be difficult to find a uniform Putin has not worn yet; it would be difficult to find a vehicle or flying device which he has not operated with the expression of a superman. By the way, it is interesting to observe how (it is indifferent if they are democrats or autocrats) former Soviet republics leaders like uniforms, as they try to demonstrate to their nations what good soldiers they are. It is not anything new in these latitudes because tsars and Soviet leaders also loved uniforms but their successors have brought the fondness for uniforms to perfection. However, Stalin wore clothes which looked like a uniform permanently it would have been impossible to see him to drive submarine or aircraft. New leaders of post Soviet states would not perhaps live without being behind a wheel, joystick or helm. Therefore they love extraordinary situations so much. The bell rings up and they immediately put on a uniform and they go at it. This summer Putin reveled in fires which afflicted large territories of Russia. He put them out both from the air and the ground. Naturally, he was always number one. Maybe, a too much diligent clerk even wrote about the miracles which happened the following day after Putin´s successful struggle with the fire. He reported that burnt trees came into leaf, spring flowers emerged. The end of the article was killing: it is impossible to explain it with help of natural laws... There were not two rainbows which were reported to accompany Kim-Il-Sung´s birth but for the beginning it was not bad. Regardless Putin´s exploits, his overactive presence on the scene of conflagrations was more counterproductive than useful. Apart from the liquidation of fires, rescuers had to guard PM and his suite. Also pieces of advice given by incompetent PM, which was complicated to avoid, were not a too useful contribution to the solution of the problems. However, what can be done when PM looked so overpoweringly behind the aircraft joystick. Observing his performance, a question arises: does Vladimir Vladimirovich have an appropriate license to operate aircraft? If not, maybe, it would be better to put out fire face to face. In that case, with a hosepipe he would have looked even sexier. 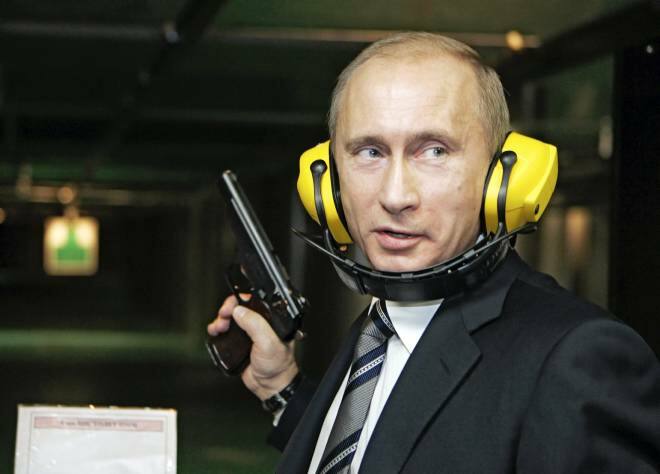 Putin can perform also in less tense situations. Sometimes it is enough to have a newly opened part of a road and a new model of Zhiguli. In such a case it is possible to kill several birds with one stone. To show who deserves thanks for a new road; to demonstrate himself like a skilled driver; during “informal” meetings with locals to prove the interest in their big and small worries of life; to disappear from Moscow from economic problems which his government is not able to solve and a possibility to be surrounded by journalists is also welcomed particularly when you want to send various messages home and abroad. Putin´s August rallye Khabarovsk-Chita had all these necessary parameters. PM became a hero of all domestic news and he deserved comments also in foreign multimedia. His splendid ride had also its blemishes, particularly, when journalists noticed that tested Lada had its doubles in convoy, just in case, and that the cost of Putin´s voyage was equal to the annual budget of a small Russian town. Comments refer to an old and famous Russian tradition - Potemkin´s villages, were very apt. Equally allusions mentioned a famous Ostap Bender´s ride beating capitalists. The majority of nation processed by controlled state media trusted their Vladimir Vladimirovitch and it is, of course, the most important. If Stalin had been a friend of small children, as Soviet propaganda aired then, Putin is different. He loves animals. Inspired by other presidents, Vladimir Vladimirovitch is showcased with his dog and he cannot miss any opportunity to meet other animal species. To meet them he does not visit zoos, he looks for them in the wilderness. Such explorations give him other opportunity to be seen with a weapon but there is a big difference between him and former Soviet leaders. Whereas they did not have any problem to show how many animals they killed, Putin does not kill. When he was “unexpectedly” enforced to save a scientific expedition from escaped tiger he used only a tranquillizer. When Putin hunted whales, famous captain Ahab would burst into tears. Putin was satisfied only with a sample of the tissue for scientific purposes. On the other hand he looked spectacularly lying on the bow having a crossbow in his hands. It is only a pity that, although operators were on the place, we could not see any whale and we had to rely only on PM´s description of the exciting situation when he faced the biggest mammals in the world. There is a double pity because we were deprived of the meeting of two giants: one aquatic and one terrestrial. 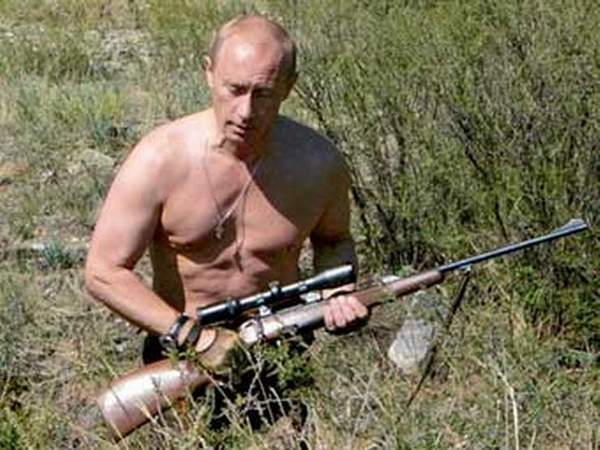 A special issue is Putin´s acting in the role of a woodman and a sportsman. Nobody can question his sportive skills but to be always Mister invincible on the tatami can become a bit boring for spectators. Of course, overmastering of PM on the tatami could provoke various associations but let´s not forget that Russia loves the beaten ones. In this way Putin could open a new space for himself. 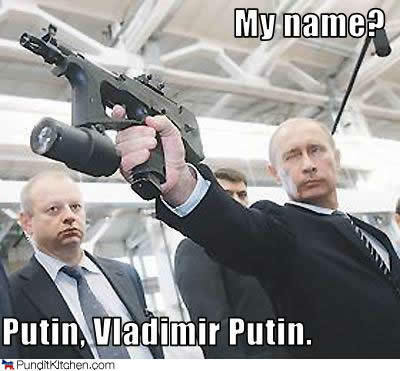 Putin like a woodman knocked the entire world at his time. To show a half-naked body in his age a lot of courage is needed, particularly when one is not Obama. The comments that we could read on the Internet were not too polite. But from time immemorial in Russia health of general secretaries and later of presidents is an important political issue and to show an excellent condition does never harm. In this episode Putin not only swam and fished, he also rode on a horseback and only the end looked rather strange. A small boy, whom our woodman met, was gifted with Putin´s watch. A real woodman should probably find different way how to display his favour. But on the other hand the watch is in Russia a specific issue. It would be only interesting to know if Vladimir Vladimirovitch gave the boy really his watch or some cheaper variant had been prepared ahead. 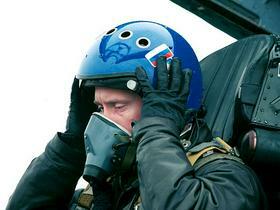 Take a bow, Putin was a refreshing appearance after Yeltsin by the end of his political career. He looked moderate and fit. Step by step as he was getting self-confidence, he began to lose the feeling of adequacy. One of his biggest problems is also a certain inability to choose in which role he would like to be presented. It is impossible to play all roles successfully. When he showed up among bikers trying to look like one of them he looked silly. When he started speaking about freedom there he looks awkwardly. He can be hardly taken seriously when he has trampled nearly all grass roots of freedom cultivated by Yeltsin. Another problem of Putin is the fact that he takes himself too seriously and he misses a real feedback. His participation in only thoroughly pre-packaged performances deprives him of the ability to be natural and, first of all, to be able to react to unexpected situations. When he finds himself in such a position he very quickly loses all his fake faces and only non-adequately acting Putin remains. For example, his incredible reactions to journalist´s questions during his official visits abroad, where it is not possible to affect foreign journalists, are a clear evidence of this fact. However, an unpleasant surprise could occur at home too. Seemingly an innocent meeting with organizers of a charity event can turn into collision. During such a meeting a famous Russian singer Yuriy Shevchuk tried to mediate to PM an alternative look at the situation in the country and Putin got perplexed. In this context, it is necessary to add that Shevchuk did not say anything extraordinary. He only mentioned some well-known facts about breaking of human rights in Russia. Firstly Putin tried to throw the singer out of balance when he pretended not to know who he was speaking to. Nevertheless, his attempt was unsuccessful. Shevchuk quietly introduced himself and continued. As an answer Putin managed to present only a collection of incoherent sentences. If Putin´s eyes could kill Russia would lose a very good singer. The girls composed second group created an antipode and they asked in their calendar Vladimir Vladimirovich very uneasy questions concerning killed journalists, corruption etc. : http://www.livejournal.ru/themes/id/22283 In which way Russian media covered the topic is more than clear. First group got a priority. If necessary all will be explained that provocative poses are more attractive than provocative questions. Such a face of affairs symbolically mirrors the situation ruling in today´s Russian media: forget politics and enjoy your life. On the other hand, it is evident that there is a part of the citizens in Russia who has not resigned and wants a change. Looking for the answer to the question How do you like him will continue. There is a certain hope in this fact. Notice: Not everybody can be familiarized with all the deeds of our hero, so the author has tried to prepare links where it is possible to see a vivid display of deeds and costumes of Vladimir Vladimirovitch mentioned in the article.